Summary: Tired of the mediocre cards with unvaried templates and simple words? How about a fantastic multimedia greeting cards with touching music, funny video and greeting voice to WOW your loved ones? AmoLink has heard your wish. Its powerful multimedia functions will give you endless inspiration, turning your online greeting cards into a music card, a talking card or even a video greeting card. Where are those paper greeting cards or ecards you received? Left in some forgotten drawers? Or neglected in the mailbox? In case your greeting card will face such a fate of being ignored or discarded by the recipient, let it be unique! It’s absolutely brilliant to add multimedia in your online greeting cards. Besides the photos, texts and dynamic effects, AmoLink also integrates multiple forms of media such as music, sound and video, catering to various needs of users, which makes it distinct from other common online card makers. Thanks to these multimedia functions, a vivid story-telling card easily comes into being. This step-by-step article will show you details about how to apply multimedia into your greeting card design. Try to release creativity, spark imagination, enjoy your creation and share your tears or smiles with AmoLink multimedia greeting card. A free online greeting card with music you sing yourself must be a big surprise to the recipient. Imagine the ecstatic look on your friend’s face when a cheerful birthday song with your wishes is floating from the music birthday cards. With the help of AmoLink music function, your imagination will become real. Now, let’s try to create cards online. 1. How to Upload Music to AmoLink? (1) Drag one or more downloaded music files from your computer to the left-hand navigation sidebar. (2) Select Files > Add to “My Music”, locate a file to click Open. There is no limit to the size of a single file as well as the number of files you plan to import. Once uploaded, tracks will be shown in the left playlist where you can re-edit its name. Formats like .mp3, .wav, .wma, .wmv, .mid are supported here. Please ensure the music you upload is properly used under copyright. AmoLink has designated buttons for playing, pausing, adding and deleting within media. Choose from dozens of beautiful, fully-customizable templates to give your music the perfect home. After you pick a piece of suitable music, click the play button in the left-hand panel to preview each track and pause it whenever you want. If you click the button to play again, music starts right where you left it. Then how to add it to your music cards? Just click the add button, a small window about music settings will be displayed. You can set a file as the background music for all the pages or just add it to the current page. (1) The initial background music will be replaced by the background sound you set later. That is to say, between “Music” and “Sound”, only one form you can choose to be a background audio. (2) Different from the background music, files add to the current page do not conflict with each other. 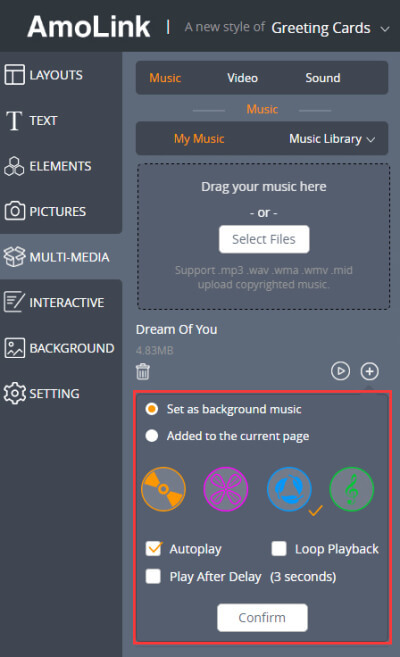 In other words, it’s possible to add several music files to the same page but only one piece of background music is allowed for the whole work. (3) Although AmoLink has no restriction on the size of file you uploaded, it has limitation on the total storage space of the file you uploaded. The limitation is based on the membership plan you are currently on. After deciding the above settings, please choose the play mode - play once, loop or play after 3 seconds delay. As thoughtful as it is, AmoLink offers users different types of music icons. You can pick one you favor, click confirm button, add it to the template with ease. 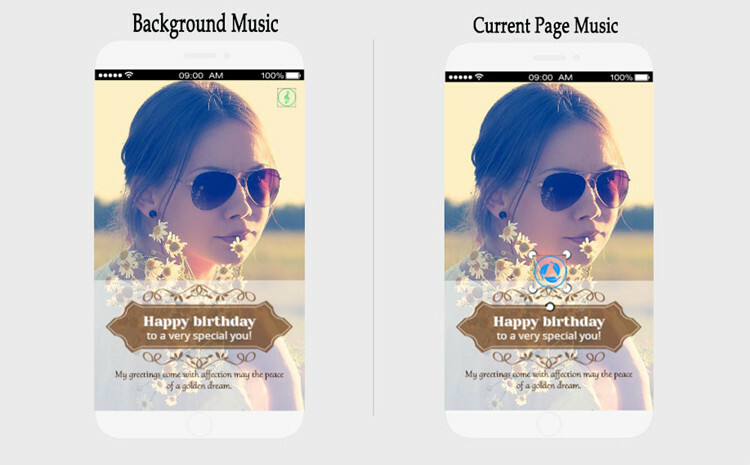 The background music icon is fixed in the upper-right corner of all the templates while the icon of current page music appears in the middle of a template and can be moved or resized as you like. In addition, you can adjust the color or transparency of a music icon to avoid clashing with the template color. Not a piece of ideal music? Locate its icon and remove it by clicking and deleting the button. If you want to clean the music file you don’t need, click the delete button below each track in the playlist. 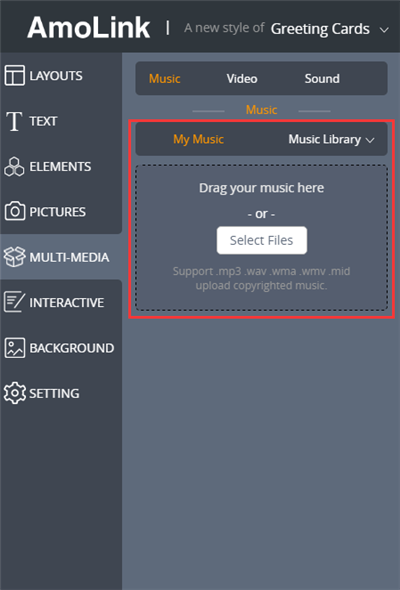 Now save and share your music cards with AmoLink! If a piece of music isn’t enough to show your emotions, why not record you own voice to create amazing talking ecards? AmoLink sound function helps you with that. Taking ecards can bring joy to anyone with the interactive characters and personalized messages. Don’t hesitate. Whether it is the warm affection for your lover or deep love to your parents, just speak it out! 1. What Can You Record? Besides some touching or inspiring words, it is fabulous to record some funny jokes to amuse those who are in a blue mood. You can also share your recent stories with family or friends who are far away from you. If you think it’s boring to use the downloaded music in your greeting card, sing it by yourself. 2. 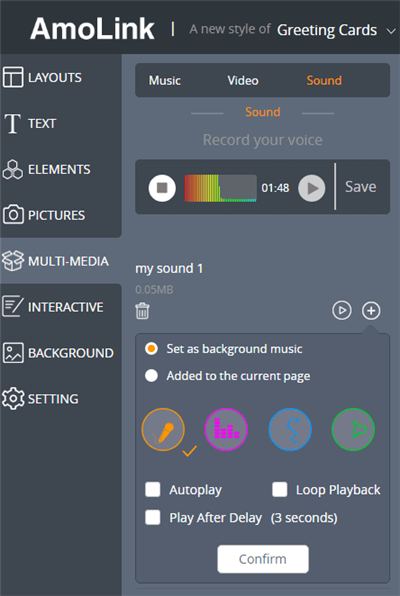 How to Record Your Own Voice? It’s very easy. Click the microphone icon to start recording. Ensure that you have connected a microphone to your computer. While singing or talking whatever you want recorded, the sound waves will be shown in the bar next to the microphone icon. Click the play button (the black triangle) to stop recording, which will automatically bring up the option to preview the recording. Once saved, it will be added to the below playlist. Since the sound function is similar to that of the music, we will not repeat it again. If you want, inserting both music and your own voice to greeting cards can achieve better effects. Only sound and music? Nope. Like a magician, AmoLink will brighten up your greeting card with video function. If a picture is worth a thousands of words, then a video is worth a million. It is the most interactive multimedia function and provides a novel way to communicate with the recipient. Just in few minutes, customize a marvelous video greeting card with fun! As to sources, enormous videos from YouTube are available for you. Different from other common online card makers, there’s no need to download a video first. Just paste its URL to our left-hand blank place. If you want to add more, input their URLs with semicolons. Click the confirm button, the video you want will be easily added to the playlist. Then you can apply it to your video greeting cards with a easy click of add button. After the video appears in the middle of a template, change its position and resize it as you like. Best of all, there’s various animation effects to highlight your video, giving life to your video greeting cards online. Be flexible. 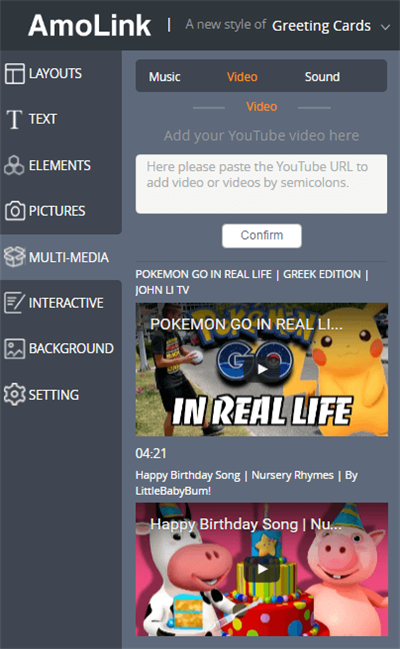 Try to combine various multimedia functions together instead of just one form. You can preview and publish the elaborate multimedia greeting cards via social media like Facebook, Twitter and more. Get inspired? Say goodbye to those boring cards. WOW your family, lover and friends with the magical AmoLink multimedia greeting cards! Create Online Greeting Cards with Multimedia Integration Do you feel bored with the same ecards provided by many ecard websites? Most of them offer the same formats and contents. Do you want to make your special electronic greeting card to WOW others with your photos, music, sound, video and dynamic effects? Here you can find a novel one to make different. Make Free Mobile Ecards for Any Occasion Sending free mobile greeting cards for any occasion gets increasingly popular. Do you know where and how to send free greeting cards to mobile phone? Herein lies the answer. Free to share and send mobile ecards to your friends in AmoLink must be a special way for you to extend your best wishes.